He was a fixture of my childhood and the recipient of my evening prayers. Kneeling beside the bed, after reciting, “Now I lay me down to sleep,” I was tasked with asking for God’s help with two teams: The Toronto Maple Leafs and The Toronto Marlboroughs. 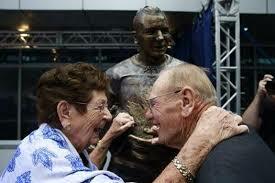 I used to ask God for an extra wish, to watch over our beloved goalie, Johnny Bower. When children are exposed to their first games, they feel the burden of wins and losses falls exclusively on the shoulders of the goalie. My family was quick to disabuse me of this notion saying a loss was everyone’s fault just as victory belonged to all, even the lowliest of fans like me. I never did stop fearing that it was too much for him to bear. It seemed to me to be the hardest job in the whole wide world. To know the man was to see him deflect my concerns with a humility I never could fathom. We were in the thick of things in the sixties as hockey was our family business. We were a fiercely competitive bunch who hated losing. We were lucky enough to bear witness to victory, not once but four times over. We were fortunate beyond reason, beyond all measure, to have the best goalie probably of all time. Shots bounced off him right and left. At the games in Maple Leaf Gardens, I kept my eyes fixed on him year after year, suffering when I saw a puck hit him on his bare face. He was tough; he was magnificent, and he was unfailingly kind. Athletes have a duty to children to be a role model and to be worthy of their worship. No one ever exemplified this better than Johnny. He did it with such joy, with such modesty, and with a flair for deflecting flattery. We held victory parties for those Stanley Cups. We would line up by the front door to receive our beloved Leafs. Friends would admonish my father, and fear for my mother’s carpets, saying, “Why not do this at a hotel?” We packed our house to the rafters. 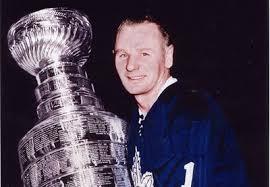 As President of the Toronto Maple Leafs, my father insisted that only our home would do. As the youngest daughter, my place was at the end of the line. We couldn’t wait to shake the hands of our Leafs and tell them how grateful we were. The lion’s share of praise belonged to Johnny. He would shrug when I gushed away. He would pretend he had nothing to do with anything or no idea how it happened. It just did, that’s all. Over the years, when our paths crossed, he was the same. After my mother died, in 2004, I was out walking one day and saw a sign in front of a sporting goods store saying the 1967 Leafs would be present on Saturday morning. My brother, the late Tom Smythe came with me, and as we stood outside in the line, I was worried about him as he was ill with cancer at the time. One of the employees came out to fetch us saying that the Leafs had requested we be brought inside with them. They were in a small basement signing posters. Johnny came up to say hi to us, as did Red Kelly, Bobby Baun, and Ron Ellis. We sat on the stairs, and as I examined them all, I noticed something about Johnny. “You don’t have a single scar on your face,” I said. “That’s because I ducked,” he joked. You couldn’t make the man take any credit for anything. I remember him going out of his way to keep engaging my brother in the conversation. I didn’t know a lot of the Leafs that came before the sixties, I didn’t know them personally, but I can’t imagine anyone was a better ambassador for the team than our Johnny. He was the most steadfast, honest, and humble man I have ever had the privilege to know. He will be revered, not just for his full-tilt splits, for all those glove saves, for facing Gordie Howe and all the others greats, night after night, but for who he was most of all. It simply is unfathomable how he could achieve so much without ever becoming proud. Courage paired with sweetness, and the kindest heart the city has known. Oh, how he will be missed. This entry was posted in Motivation, Uncategorized and tagged goalie, hero worship., hockey, sports, Toronto Maple Leafs on January 2, 2018 by Elizabeth Smythe Brinton.